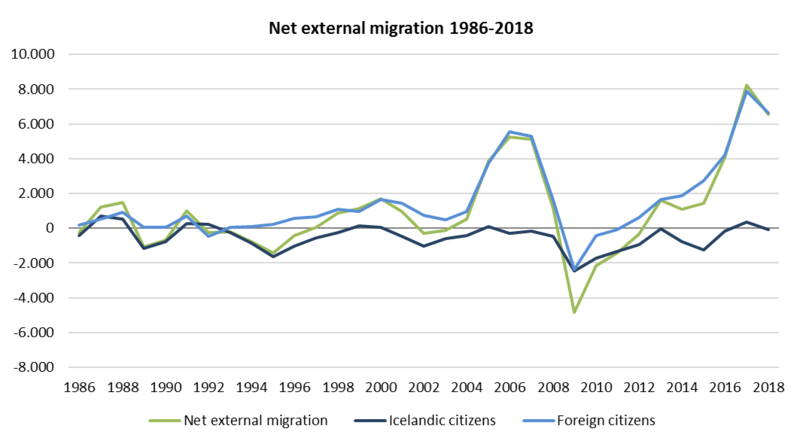 Net external migration in Iceland in 2018 was 6,556 compared with 8,240 last year. The number of immigrants was 14,275 in 2018 compared with 14,929 in 2017. At the same time the number of emigrants increased from 6,689 to 7,719. Of the 2,803 Icelandic citizens who emigrated in 2018, a total of 1,822 migrated to Norway, Denmark or Sweden. Most of them emigrated to Denmark, or 921. These countries were also the major countries of origin for immigrating Icelandic citizens, as 1,868 out of 2,738 immigrants came from these countries. Most of the foreign citizens emigrating from Iceland migrated to Poland, or 1,682 out of 4,916. Poland was also the largest contributor of immigrants with foreign citizenship, 3,797 persons out of 11,537 foreign immigrants. From the year 1996, the highest number of foreign immigrants to Iceland were Polish citizens, with the exception of the year 2004, when Portuguese citizens where most numerous. In 2018, 3,897 people with Polish citizenship immigrated to Iceland, and Polish citizens were also the largest group of foreign nationals to emigrate from Iceland in 2018, or 1,707. When only taking into account internal migration between regions in the year 2018, only three regions had favorable net migration. The South had most internal migration (168), the Southwest had 113 and the Capital region had 7. Other regions had negative net migration. When considering external and internal migration, all except one of the country’s regions experienced positive net migration in 2018, the Northwest (-107).